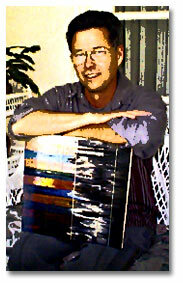 Artist Richard Bruland has been painting and exhibiting his wonderful work for many years. Richard has produced some of the most amazing artwork around creating textures and colors that encourages the veiwer to see the indescribable. You really have to own his wonderful work to truly appreciate it so you can spend hours looking into the layers of etheral abstract land/sea/sky/scape. On the friendship side of things - well, here's another friend who lives too far away to reach on a regular basis but that has not in the least diminished my respect and fondness for him and his dear family. Always encouraging me in all my own creative endeavors, he remains a true friend with my gratitude.